Recently Renovated! This spacious home has it all. Convenient two car garage, ample off street parking and a large deck overlooking a wild life sanctuary. Just a short walk into downtown Saugatuck for great dining, shopping, theater, art galleries and much more. The large great room allows group gathering and the separate den invites solitude for quiet chats or naps. A year round sun room is especially cozy with large hot tub just steps away from the wrap around deck! The spacious deck allows for outdoor dining with a grill and fire pit. The kitchen adjacent to the great room is equipped for dining in. 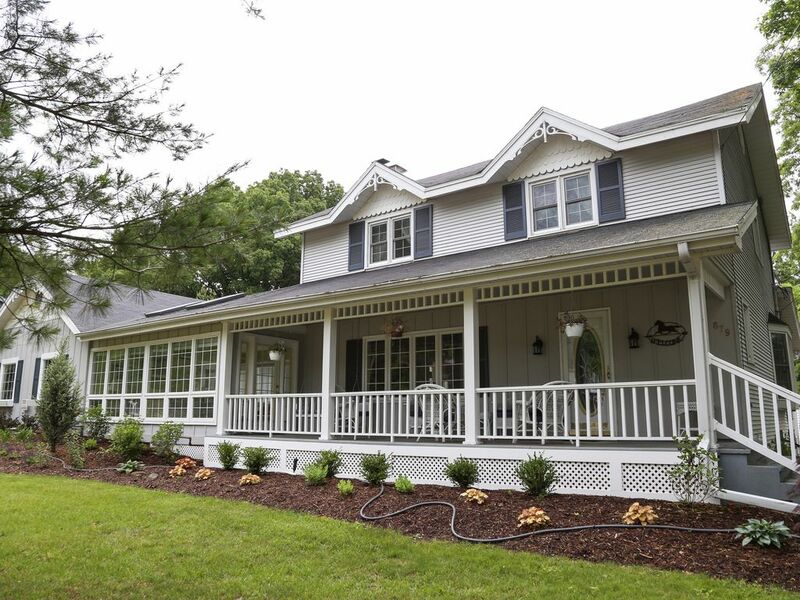 Three bedrooms plus sun porch with twin/trundle bed and sofa sleeper, sleeps 10 with 2 full baths. Upper level bath has been remodeled and laundry is located on the upper level. Bedrooms have been freshly painted. A real home - away from home. Easy 5-10 minute drive to Lake Michigan beaches. Maximum capacity 12 - includes children and infants. Walk to downtown Saugatuck's shops, restaurants and river parks. Short drive to Lake Michigan public beaches. digital antenna to get some local channels. Smart TV with Netflix..
Several locations in Saugatuck/Douglas for rentals. Several locations in Saugatuck/Douglas for Boat rentals. You can rent a boat for a day of play or go out on a Charter Fishing tour. Open Tennis Courts located at Saugatuck High School 401 Elizabeth St. Saugatuck Mi 49453 and Downtown Saugatuck on Butler St. This is great house for a big family, huge deck with a fire pit. It has a large table in the kitchen area that was nice for eating and playing games. Also has a beautiful sunroom with a table for six where we played games. We enjoyed the hot tub everyday. Loved the location, very easy walk into town and great restaurant right across the street. Very spacious!!! Nicely decorated, comfortable, close to downtown! The home was very nice, clean, spacious for big group. With in waking distance to stores, restaurants and bars. Reservation process was super easy. Description was dead in with the home. Perfect place to stay for a group! Very clean and nicely decorated! A group of 9 of us stayed and there was plenty of room, everything was clean and very cutely decorated! Hot tub was an added bonus. Great location and close to everything! We would definitely stay again! Thank you so much for the kind words. So glad you enjoyed our home. If there are any suggestions that would make your stay or anyone’s else’s better, please feel free to let us know. We certainly hope you come back soon. Bobby and Jeannie Raitt. We really enjoyed the house and all it has to offer including the spacious porch and hotub. Everything seemed clean and felt very homey. We are delighted to hear that you enjoyed your stay and felt comfortable. That's precisely the vibe we are shooting for. We hope you come back again and liked it enough to recommend it to others. If you have any suggestions, please let us know. We recently rented this property over New Years and had a great time! The house was very spacious and updated and we felt that it was even nicer in person than the pictures. There were 8 of us total (4 couples) and there was more than enough room for everyone. The living room was big enough for everyone to hang out and the kitchen table was perfect for cards. The wifi login and access to netflix were nice surprises given that it was the winter and lounging outside was not an option. The property was very close to the downtown area and would be perfect any time of year. I would definitely stay there again! the yard and deck areas were in serious need of updating and maintenance - lots of weeds growing in all of the landscaping and the deck was worn and dirty - as was the patio furniture outside - we never used it as it was not nice! The bathrooms were not fully clean with mildew on all of the caulking, which also was coming loose - had a problem where water leaked through the ceiling when the caulking in the upstairs shower has become pulled away from the tub. Overall not a bad place, but would have expected nicer and cleaner for the price! Please come back as this property will exceed your expectations now!. The new owners have taken much pride in a complete renovation both inside and out. Cancellations received thirty or more days in advance require a 25% cancellation fee. If you must cancel with less than thirty days’ notice there is no refund.